The Stillness of the Wind is the follow-up to Where the Goats Are, a slow and quiet game about tending to a small goat farm. The original game has never been available on iOS, so it will take some experimenting to figure out what things do if you’ve never played either game before. There aren’t really any goals and there’s no right way to play, as I believe it ends the same way no matter what. But I’m writing this guide to help those who want to maximize their time with the game and not have to replay it because they missed too much. – For iOS, the controls are fairly simple. Tap to pick up an object, and tap it again to drop it. While holding an object, tap on something else to try and use the item with it. For instance, use the bucket on the goat to milk it. – For certain a tasks, prompts will appear on the screen. Follow them to complete the task. – Tap the goats to pet them. I think it also makes them follow you around, but it could just be a coincidence. – If you don’t want your goats to run away, make sure to close the gate after you leave their pen. And especially keep the door to the bigger enclosure locked, because it will be much harder — or maybe even impossible — to get them back if they get off the farm. – Make sure to bring your basket of eggs and produce into the house every night or the stuff inside it will just disappear. I learned this the hard way. – You can use the stick to draw in the sand! It’s just for fun. – You can walk off the farm and explore, but be careful. The first time I tried it, I hit a bug that forced me to keep walking away from the farm and I couldn’t get back. If you don’t hit a bug, it seems night doesn’t come when you’re far away from the farm, so you can stay out as long as you want. Please correct me if I’m wrong. – The game saves when Talma goes to sleep. If you hit a bug or just aren’t happy with the way your day is going, you can close the game and when you open it again, it will restart the day. – The story is told through letters from Talma’s family. They come from the traveling merchant/postman. If you miss him, he’ll leave the mail in the mailbox, but you need to grab it from outside the fence or it won’t work. – To trade with the merchant, you need to barter. He might give some indication of what he wants (like cheese), but otherwise you need to guess what he’s willing to accept. – Make sure to check the bottom of each letter to see if you received a gift! – Make sure to buy hay for your goats if they’re running low! 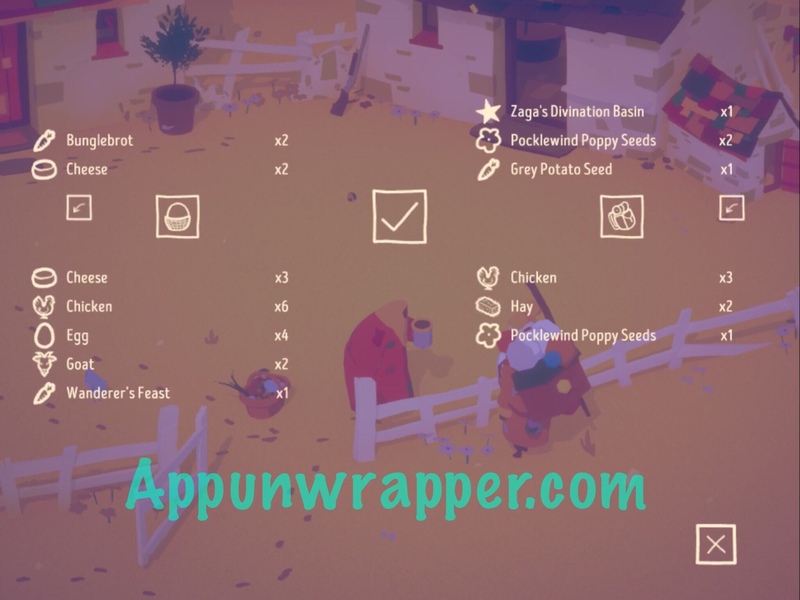 Basket: Pick this up and use it on the chicken coop to collect eggs. You can also use it to collect veggies from your crops and mushrooms from outside the farm once they start to grow. Make sure to take it inside before going to sleep! Milk Bucket: Pick this up and use it on a goat to milk it. Then carry it into the cheese churning hut and pour it into the churn. Follow the prompts by tapping when it tells you do and then rotate your finger around and around until the milk is churned. Once it’s over the firewood, tap the wood to light a fire. Then wait until the fire goes out. Tap the churn and then knead the cheese as prompted. Water Bucket: This is just outside the fence near the well. Use it to collect water from the well. The water is needed to help your plants grow. Hoe: Use this to sow the soil so you can plant seeds. Make sure to water them after! Shotgun: If you get some bullets, you can shoot your chickens or goats, but why would you want to do that? You can also shoot the wolves to keep them from eating your livestock. Oh god no why would you do that?